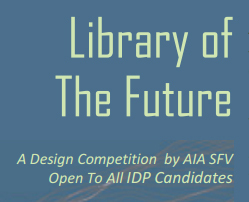 The competition, in two phases, involves the programming and design of the library of the future. The neighborhood library of the future will, undoubtedly, be a facility that is quite different from today’s library. The roles libraries play in the life of a neighborhood will evolve overtime to provide a new and altered service to the public. What will those services be and into what physical form will the library morph to serve the community? The competition is open to all NACRB/IDP participants. The project submissions can be from individuals or teams. Credit for IDP hours is available to all participants working with a mentor. Each participant will be responsible for self-reporting hours as detailed in the IDP Guidelines. A maximum of 400 hours is available to participants. Available hours for Phase 1 will be a maximum of 100 hours. The remaining hours will be available to the Phase 2 entrants. For more information on this competition, click here.